I woke up fairly late, got ready quickly. Father Sergey is picking us up at 10:30 am for the 11:00 Divine Service - which will likely start somewhere around 11:15.
the buffet breakfast again - which is similar to yesterday's offering, but with a little variation in the fare. We notice that there are several families on vacation and a lot of English writing on t-shirts - especially among the children. Sergey and Alexey pick us up. We arrive at church. Father Sergey is the celebrant, and Father Alexey Trapiznikov - whom I have not met before - assists. Before the service, we are greeted by a visitor, a pastor from Canada who has a missionary ministry. He serves the Association of Free Churches (I think this is the name of the church body), a Norwegian Pietist church that is, I believe, headquartered in Minneapolis. It is a denomination that is both liturgically "low" and has a "low" view of the office of the holy ministry. He has worked with Father Pavel (Zayakin) for many years, and the two are good friends and colleagues. He is on his way to Abakan to assist with Father Pavel's Bible camp for young people. He is dressed in civilian attire, and he tells us about his eclectic Lutheran background, having served congregations in both the LCMS and in the ELCIC. he currently lives near Vancouver, and makes annual mission trips to Russia and India. He ended up in the Free Church because of their particular brand of low-church conservatism. His church body does not "ordain" women. When we ask him what is his church body's view of the Lutheran confessions, he is unsure. He is a very likable middle-aged man and is shadowed everywhere by his 30-ish Russian translator. After our morning visit and tea, Father Sergey prepares for Mass. He is a soft-spoken middle aged man with a kind face, a closely-cropped beard, and short dark hair that is starting to develop "salt and pepper." As the celebrant, he is clearly in charge. Not typical for the services is Father Alexey (Streltsov) snapping pictures on his Nikon. Father Alexey (Trapiznikov) preaches the sermon and serves liturgically as the deacon. The communion rail only accommodates two communicants at a time, and the pastors only have room to scoot sideways between rail and altar to distribute the Holy Sacrament. The church furniture originally came from the fist seminary in Novosibirsk. After Mass, we retire to the kitchen for tea and cookies. In deference to my caffeine addiction and shortfall, Father Sergey presents me with a day-glow yellow half-liter bottle of Mountain Dew with a rascally smile on his face. We all pose for a group picture in the sanctuary - except of course, Father Alexey, our photographer. Sergey and Alexey bring us to the hotel to check out and then bring us back to the church flat. They go off for a while. While waiting for them to return, I look out the window and journal. It is warm and sunny outside, about 80F. It looks very much like an American scene outside - with a few differences. A young girl is walking a dalmatian, who would just as soon stay put under a tree. She has to coax him to go. Two babushkas (elderly ladies) walk together down the street clad in their "uniform" of flowery dresses and head scarves. Two middle-aged women walk together with what appears to be a dachshund/beagle mix. Two younger guys are checking out a car - perhaps to buy. One of them is smoking a cigarette. Cars zip down the highway that is maybe a quarter mile (if that) from the flat. The building across the street has typical enclosed balconies with clothes hanging outside. Some people are on foot bearing plastic grocery bags. Tired looking Latas (a Russian domestic automobile) roll by in sharp contrast to the more modern-looking imports - mainly Toyotas brought in directly from Japan, as evidenced by the steering wheel placement on the right. Summers are very short here, and I get the impression that people make the most of their warm season. Like my family members in Ottawa, they experience about six months of winter - with short days, reaching a peak of sunrise at about 10:00 am and sunset at about 4:00 pm. Fathers Alexey and Sergey return and pick us up. We are headed to lunch somewhere in Yekaterinburg. Dan reads Crime and Punishment on his Kindle. Alexey and Sergey converse intensely in Russian. I'm getting a little road-weary. I'm also quite homesick and looking forward to getting home. Today is Miss Grace's birthday, but it's only 4 am back home. Maybe I'll be able to get on an Internet connection some time today. Otherwise, I'll ask Dan for his phone and fire off a text message to my dear wife. 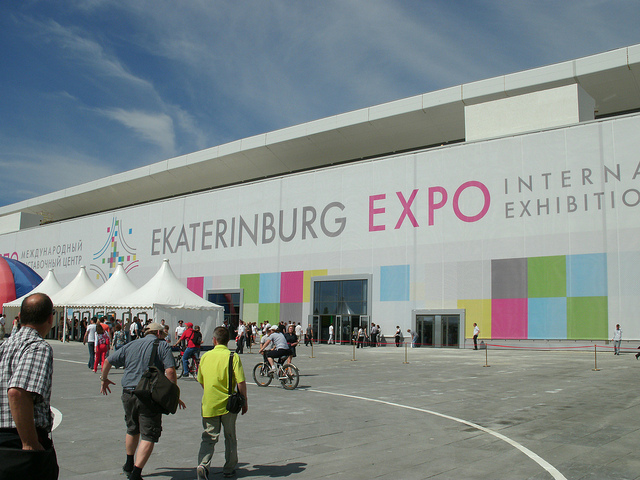 Our drive takes us to a large event called the Technology Expo at Yekaterinburg - held in a huge convention center. Parking and admission are free. It is really incredible! On the way in, we have to pass security. The guard laughs at me good-naturedly as I have to deal with my crucifix, pocket watch, Palm device, pocket knife, and all sorts of coins, etc. Unlike in the U.S., my small Swiss Army knife was not a problem. I scramble to gather all of my things as my companions also have a laugh. We ate lunch there, traditional Russian fare: salad (tomatoes and cucumbers), bread, pelmini (dumplings) and coffee/tea. I took a chance on the instant coffee, as the brand name suggested it might be some kind of espresso. It was a mistake. I should have gone with the tea. But the rest of the meal was nice. We spent a good bit of time at the show. We took a lot of pictures. Father Alexey eplained that by air, Yekaterinburg is six hours from both London and Beijing. The movers and shakers of Y-burg are trying to position the city as a business hub, an alternative destination at which to meet halfway. Alexey is skeptical. Russian president Vladimir Putin is very much pushing "nanotechnology" and Russians teasingly refer to him as the nano-president ("little president"). There is a girl at the show who wears what seems to be a red latex suit consisting of a skimpy top, short-shorts (also latex?) with the word "NANO" written in western letters on the bum. The outfit was completed by her towering high heels. There are also a couple of girls in day-glow green leotards advertising a bank. They look a bit like the way C.S. Lewis portrayed the blue woman in his science-fiction novel Perelandra. Father Daniel suggests that I get a picture. Since my new policy is not to automatically say "no" and not hide behind my being an introvert - especially as a non-Russian-speaking foreigner - I walk up to them and motion to my camera asking: "Фото пожалуйста?" They insist on including me in the picture. They are fluent in English and are interested as to where Dan and I come from. They are very good sports. In the middle of the exhibit there is a huge, detailed model of the city of Yekaterinburg. 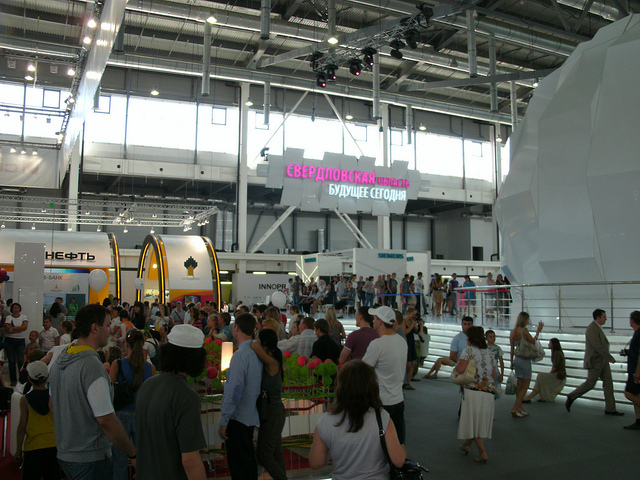 There is a section devoted to various businesses in Chelyabinsk. There is even a booth selling Christian icons - which would have been unheard of twenty years ago. The place is crowded with people of every age group. The most amusing to watch are the young couples. Almost inevitably, the guys are quite casual - if not bordering on slovenly - while their wives or girlfriends are dressed to the nines. It is so common as to be a cliché. I buy a coffee mug on the way out that epitomizes Alexey's critique of many politicians' vision of modern Russia. The mug had a tribute to Russia on one side, and another to the USSR on the other. The caption reads (in Russian) "One History, One Country." It is the view of those who see modern Russia as simply a reconstituted Soviet Union. We go outside where there there are various trucks and heavy equipment - including a high-tech helicopter. Afterwards, we drive downtown for some sightseeing. In front of the main administrative building is a statue of - who else? - Lenin. Father Alexey directs our attention to the top of the Soviet-style administration building complete with statues of triumphant workers and stars and other garish Soviet symbolism. But Father Daniel is not with us. I turn around to see him chatting with a group of young people who are sitting on the base of the Lenin statue. I figure Dan is fielding questions about the United States or helping young people practice English. I take a picture as Dan calls me over. The college-age students hail from Spain, Ukraine, the Czech Republic, Poland, and Russia. They are loud, gregarious, and friendly. They all speak very good English, and are respectful. We chat a little about where we come from. One of the guys jots down his e-mail address so I can send him the pictures. Father Sergey tells us a funny story about the Lenin statue. Down the avenue are statues of Sverdlov and Kirov - two other Bolsheviks. They seem to be pointing to Lenin. The joke is that they are asking Lenin where he got his nice coat, and Lenin in turn is pointing at the shopping center across the street. We went to that shopping center, which is located on a beautiful brick pedestrian mall. We stroll along the walkway in the sun and chat. We go inside and up the escalators to the 5th floor of the mall where there is a small food court. There we find a restaurant called Hot American Pizza, a pelmini place, a more traditional Russian lunch establishment, and a (believe it or not) dessert place called Cherry Berry (back home we frequent a frozen yogurt shop of the same name). Today is Miss Grace's birthday, and I later was to learn that she and Leo made several trips to Cherry Berry. I am getting increasingly homesick. Dan and I order pizza - of which Alexey quips is actually neither hot nor American. Sergey gets the Russian food, and Alexey opts for the Pelmini. We eat our "hot American pizza" in the capitalist mall as we look out the window to see Lenin pointing at us. It is surreal and ironic. Lenin seems so lost, so anachronistic and defeated, though his body is frozen in his usual triumphalistic pose. He stands there in self-mockery, oblivious to the fact that he has been disgraced and left in the ash heap of history. From our view we see a good sized crater behind a fence. It is filled with water. Alexey explains that in Soviet times, it was a public toilet. He said that it was free. I remarked: "It still is" to the great amusement of my Russian brothers. I think my attitude for Big Government and natural inclination to make fun of the state dovetails nicely with the post-Soviet sense of humor about the USSR. Or they may just think I'm goofy. I figure it's a "win" either way. From, we see a sign on the wall that is missing a letter. I ask Father Alexey about it. It says ССС-. The last letter has been torn off. 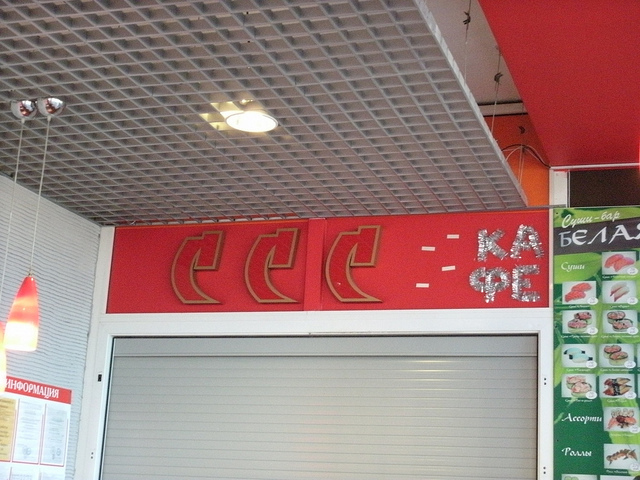 Alexey confirms that indeed the now-truant final letter was a Р - the Russian R. This was the sign for the now-defunct "USSR Cafe" - but the R has been taken away. The word Кафе remains though. More symbolic irony. We visit a bookstore, a sort-of Russian version of Barnes and Noble. They have a small English language section of books in English - some paperback classics. They also have a section for learning Russian. I buy a Random House course with 40 lessons, a book and 3 CDs. I also pick up a phrasebook with CD for half the cost back home. Father Daniel buys a beautiful political map of Russia. Alexey picks up a few books. Pastors are seldom as happy as when they are in bookstores. I wandered off to buy some souvenirs. My inability to communicate is a profound frustration. The clerks are patient and kind, and they treat me like a child counting my coins for me and taking them from my outstretched hand. I do know how to apologize and indicate to them that I don't know Russian. On the way out, I see a 3D book with a jumping spider on it. It includes a 3D viewer with various stereoscopic photos of bugs and spiders. It costs the equivalent of $10 U.S. Of course, I have to buy it for Leo. My Visa card is declined - which Dan suggests is a safety feature because I had just used it a few minutes ago. I pay cash. We continue our stroll. The architecture is western, modern, and beautiful - in some cases even opulent. Father Sergey goes back to the car and meets us at the other end of the pedestrian mall. Sergey and Alexey drop us back off at the church flat. Dan and I venture out for a stroll and end up back at the beer tent. We order a couple beers. This time, I have my phrase book and dictionary. With these tools, Dan and I set out to figure out the menu. I call over to our waiter whose name is Ильхом (Ilichom?) - who is probably Kazakhstani. He remembers us from before. This time I use the phrase book to order in Russian. He is amused and asks to see the phrase book. He uses the book to ask me how much the phrasebook costs. He is looking at the English section. We all have a good laugh. I took a couple pictures with him and the phrasebook. I pay for our meal in cash, and Dan picks up the tip. We head back to the flat. I have trouble getting to sleep. Here is a link to all of my pictures of Day Twenty One.